The Odd Duck looking On! 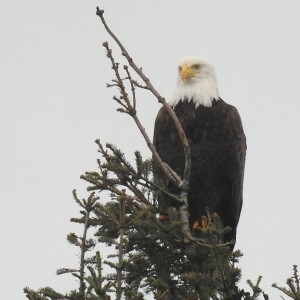 It is difficult to get a good shot on a very cloudy day. 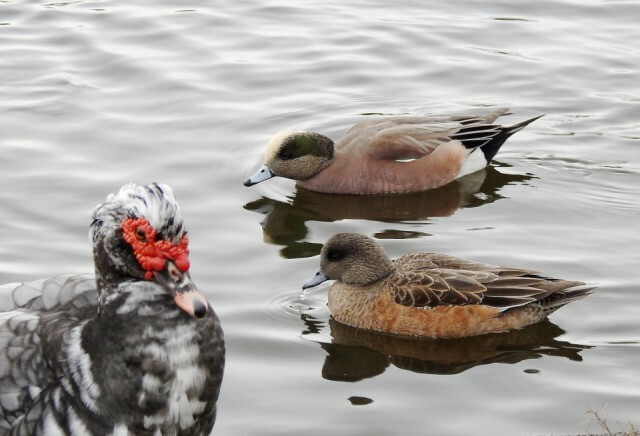 Mr. & Mrs. American Wigeons were swimming by drinking their fill of the pond water while the Muscovy Duck looked on. I thought it looked like a Silly Blip when I downloaded this photo.....perfect for Saturday. I think someone has been feeding the ducks since they all quickly swam toward me and the Muscovy walked right up to me. There are signs everywhere saying, "Do not feed the ducks." But, why would the ducks all come "running" to me. Cloudy but not much rain today. Even a tiny peak at the blue sky.....but just a peak. I am sorry to say it was a lazy day. I have been online looking for some bathroom fixtures and design ideas.....then got sidetracked looking at stuff that either popped up or lured me away from my original goal. Very time consuming......and I didn't even get to Blip except for a few minutes.